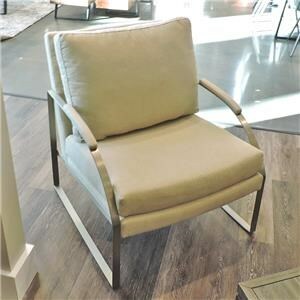 Accent your living space with this sleek and sophisticated swivel chair. A compact build with square track arms brings a unique contemporary style. Attached back and cushioned seat constructed with high quality fiber and foam ensures ultimate comfort with long-lasting support. 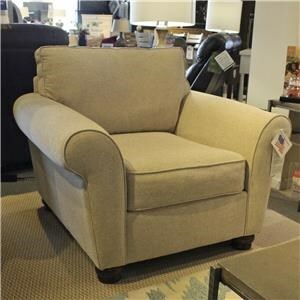 The sturdy swivel base and engineered hardwood frame provides durability for solid support. Love this look? 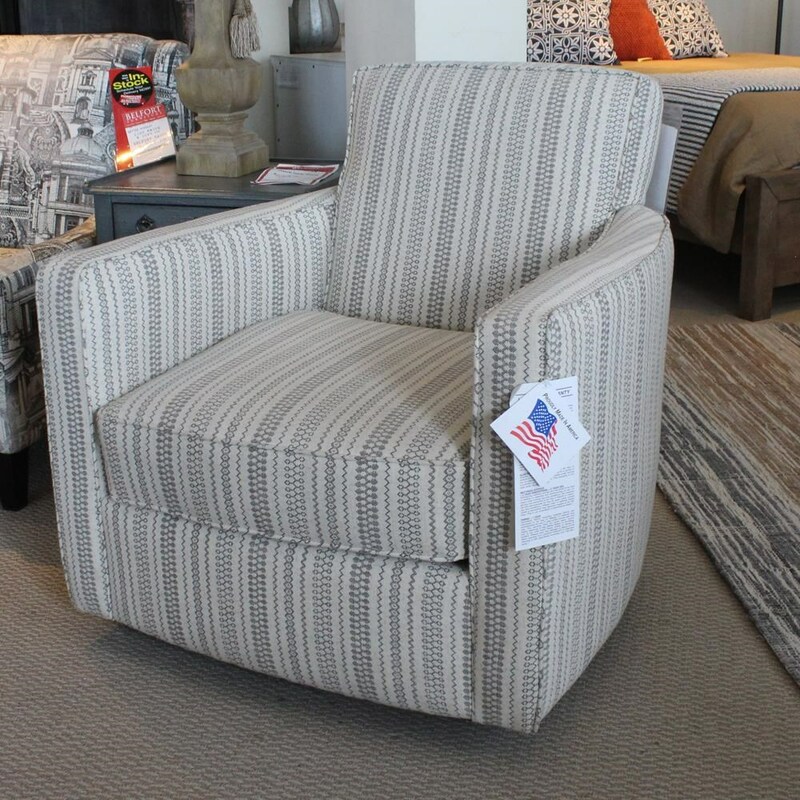 Purchase this chair as shown or visit our showroom to view this brand's fabric options to customize it! 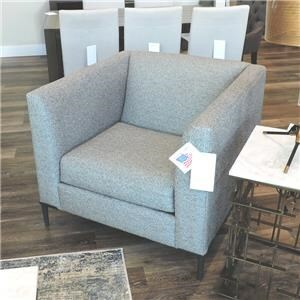 The 55D Swivel Chair by Metro Collection at Belfort Furniture in the Washington DC, Northern Virginia, Maryland and Fairfax VA area. Product availability may vary. Contact us for the most current availability on this product. 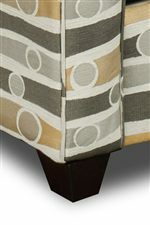 Fabric Options This collection is available in a variety of fabric choices. Frame Construction Frames are made of engineered hardwoods, typically seven-ply pine or thirteen-ply Russian birch precision cut by our state-of-the-art routing machine. Solid oak & pine components are also used. Frames are doweled & glued with extra bracing for durability. Seat Support The steel sinuous spring seating system utilizes heavy-gauge tempered steel with double braced plastic coated wire for increased strength and improved ride. There are seventeen springs per sofa seat deck with double sprung edges for extra support. Padding & Ergonomics Seat cushions consist of premium 1.8 lb. density polyurethane foam wrapped in two layers of thermally bonded polyester fiber. Back cushions & accent pillows feature hollow-filled, siliconized polyester fiber for a lush feel and durable, resilient wear. Warranty Frames come with a limited lifetime warranty. Seat spring systems are warranted for ten years. Cushions come with a limited two-year warranty to the original retail purchaser against loss of resiliency. This casual, living room furniture collection will bring homes a soft upholstered look with a comfortable homey atmosphere. Covered in plump upholstered cushions with decorative flared arms and welt cord trim, this chair and sofa collection will combine just a hint of style with a whole lot of comfort. 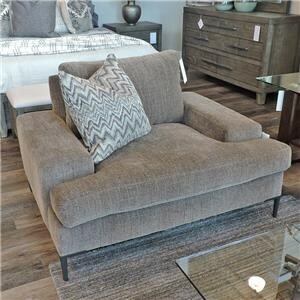 The 55D collection is a great option if you are looking for Rustic Relaxed Vintage Transitional Contemporary Traditional Casual Coastal furniture in the Washington DC, Northern Virginia, Maryland and Fairfax VA area.